CHECK-OUT WHAT’S INSIDE AND “WHY” I HAD TO WRITE THE 2ND EDITION. Making the decision to have a ‘lifestyle’ where my work and family are one and not a work/life balance, has meant that I’ve not only had to value my time (not to every 30 minutes but every 10 minutes) but also my organisation (me and my team) as well as my personal commitments. Something I’ve taken away from this is the knowledge of how my energy shifts throughout the day.The way I was working three years ago is very different to today. The second edition is clearly a new and even better book. Bang up-to-date. Wonderfully practical and full of good, honest, common sense which is rare in the digital world. Warren shows you what you can do to help yourself. Information I had previously shared around the social networks had changed. The tools I had shared were either no longer in business, or had been outperformed by competitors. I knew that because the online world had evolved, that I also wanted to completely re-write the book, and bring it as up-to-date as possible. 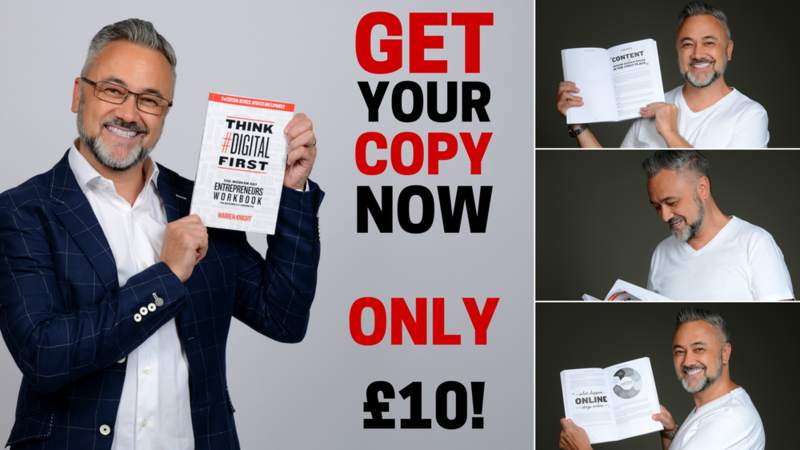 Think #Digital First Second Edition is a workbook designed for creative entrepreneurs, business owners and sales and marketing managers that shares with them the importance of having the right mindset to focus on technology, sales and marketing. I have analysed exactly what my audience wants from me, and I have taken what was a readable book, and turned it into a workbook. The way you learn has evolved, and I knew that I needed to do something different and unique. The second edition of Think #Digital First is a unique combination of how-to’s and real-time worksheet implementation.